For the basic topologies, the order from lower power to higher power was usually Flyback, Forward, Push-Pull, Half-Bridge and Full-Bridge. While this basic power order still remains true, for designers to push to new heights in power density, topologies that were once used in much higher power applications are now finding their way into relatively lower power, small form factor, high density power converters. Power management IC manufacturers are enabling this trend by adding not only more features but also by integrating high voltage gate drivers within the controllers. The performance of isolated DC-DC power converter is generally provided by Efficiency and density (Watts/Volume). 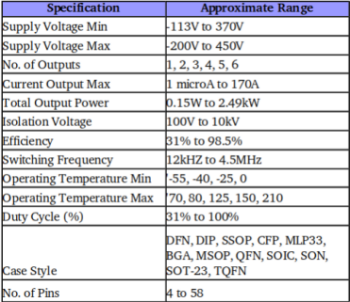 However, there are quite a few specifications as mentioned below which are to be considered while selecting the right DC-DC converter. The “Range” given in the below table denotes approximate values and the user is advised to verify the actual data from the suppliers. Note: Please refer the orginal spec data from the manufacturer. We are not responsible for the data presented in the above tables.